Waiting for the dress to arrive, but the process has been good so far! 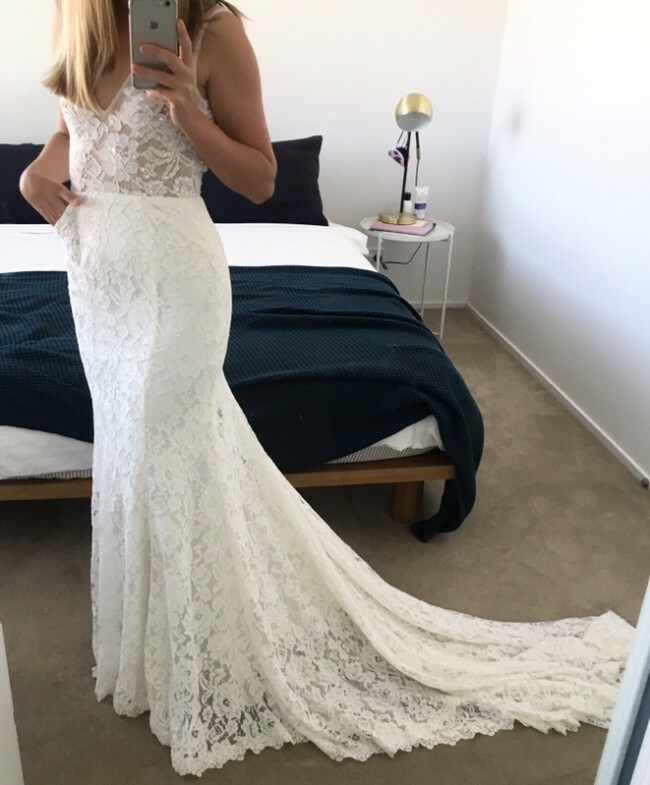 Selling brand new ‘Frankie’ dress with from Australian designer Made With Love. Dress is brand new and unaltered as I have found another dress to wear instead. Dress label is a size 8/XS. Street size I am a size 2 and can provide measurements if needed. It has pockets, no ruching, and a full train. Very small sequins have been added to top of dress but these can easily be removed if not wanted (they do however add a nice touch/sparkle). Dress comes with Made With Love bridal bag and willing to ship internationally. "Our Frankie. Her sensual lace adorns her bride and leaves all her guests murmuring. She dares to plunge deeply in the front as her floral lace decorates the bodice, only to reveal her back so gloriously defined with a standout low V-backline. Her bottom is wrapped in detail that emphasises the goddess within and her lacey skirt extends into a train as if to inherit all she touches. And her pockets! Oh, her pockets. So delightfully serendipitous, because in Frankie, it’s so easy for her bride to be breath-taking."